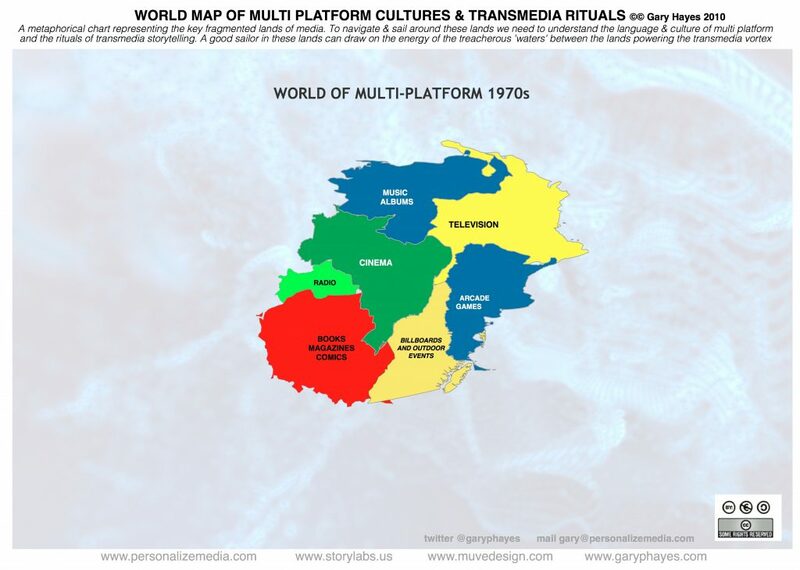 Gary Hayes is one of a handful of transmedia storytellers and theorists around the world who has actively explored the practice of creating and experiencing a transmedia narrative through spatialization of media, more specifically, through spatial visualisation. Hayes’ Mapping Project “World Map of Multi Platform Cultures & Transmedia Rituals” consists of two maps that represent a comparative study of the multiplatform media world in the 1970s versus in 2010, the same year that these maps were originally created. Despite its unique nature and having been originally self-published by the author on his professional website under a freely shareable creative commons license, I was surprised to discover that this set of maps is relatively unknown and uncirculated within the transmedia community. 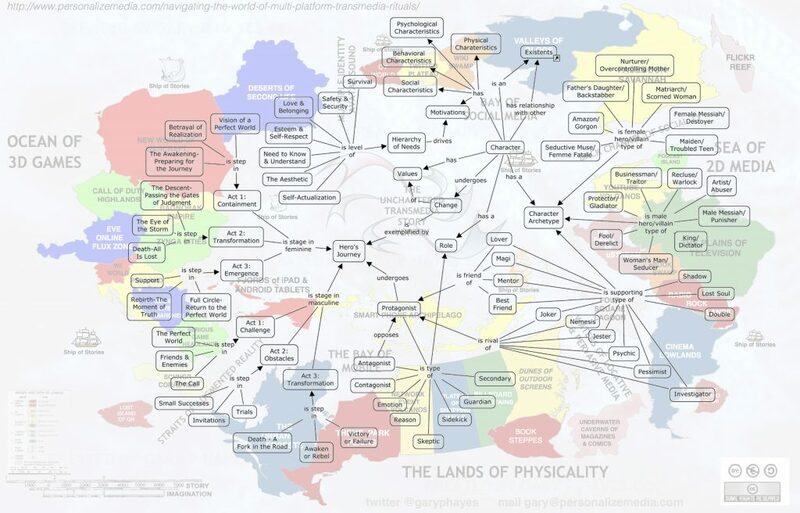 The maps were published as part of a longer 2013 article rewritten from a keynote presentation talk and were used to contextualize the ‘state of the multiplatform transmedia industry’ during that year. 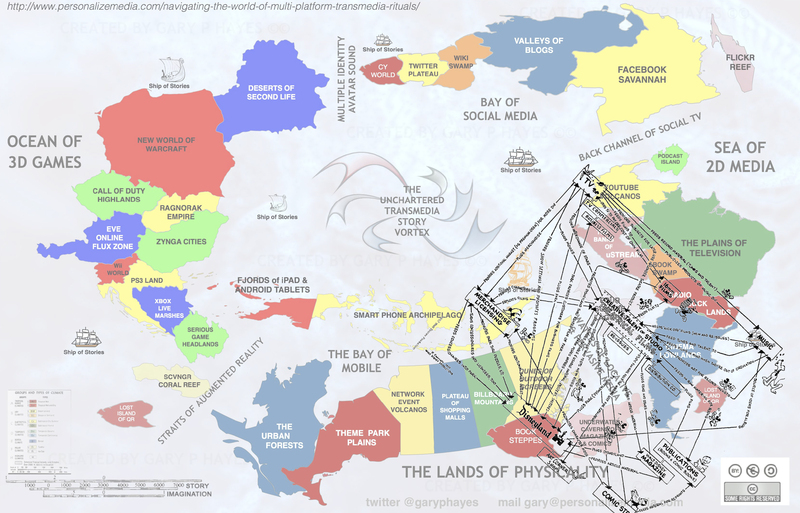 The top of both the maps states that it is ‘a metaphorical chart representing the key fragmented lands of media.’ The key difference between the two maps is the depiction of change in the media landscape due to this transforming fragmentation. 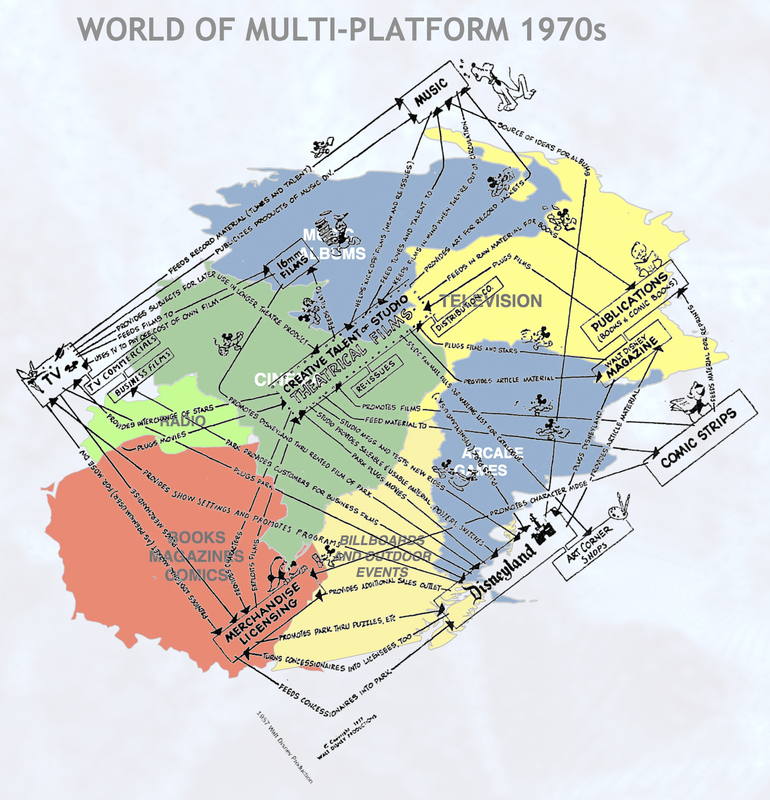 The first map of 1970s represents a closed territory with clear, distinct generic media-nations of television, music albums, cinema and so on, positioned in high-color contrast against each other. While both these maps are thematic and designed to be of epistemological (and to some extent, of pedagogical) value to multiplatform storytellers, the function of the first one seems to be to serve the purpose of the second map depicting the year 2010, which is both of higher relevance to the transmedia conversation and can be used as a reference or an iterative base map by professionals to visualize the most current state of the creative media world. This second map renders massive, ‘world-scale’ free-flowing blocks of ‘continents and islands’ to represent highly diverse yet highly specific forms of media. This conscious specification of labelling media platforms as branded entities as opposed to popular genres (eg. youtube volcanos vs online video and new world of warcraft vs. massive multiplayer online games) paints a much more accurate picture of ownership and therefore, accessibility within the mediascape. Instead, the author chooses to delegate the ‘genres’ or ‘channels’ to the surrounding waters (eg. Ocean of 3D games, Bay of Social Media, Sea of 2D Media). Although the boundaries of these media-nations seem fairly arbitrary, with no metadata provided to imply their demarcation, rendering this industry terrain as an actual geography allows us to understand their relative sizes and therefore, relative significance. While there is no definite way to know from the citations, legend or the graphical scale, what exactly these sizes embody, one can assume that they represent a combination of the media-platform’s audience reach, its colonization in media and physical space, and its monetary prowess. Throughout the map, data variables such as these are tackled through various design choices, which at certain points raise more questions than answers. For instance, the color choice, wherein the legend is almost misleading and reads groups and types of climate including tropical, temperate and so on. One reading of this could be through temperature and Marshall Mcluhan’s theory of Hot and Cold Media, where cool-colored media-platforms are not high definition and allow looser spaces for participation, such as Valley of Blogs or Deserts of Second Life, as opposed to the hot red New World of Warcraft, wherein the engagement mechanics are carefully designed to elicit fixed responses. Yet, the more effective of the design choices includes the usage of prefixed and suffixed geographic language such as plains, mountains, dunes, deserts and highlands to highlight qualitative attributes of these emerging media like market value, ability for engagement, limitations etc. Lost Island of QR, for example, connotes the media industry’s ineffective attempts to incorporate QR code technology, or Flickr Reef that holds high-quality, beautiful images but is positioned in a far corner of the world, suggesting limited reach or usage. The rituals of the landscape are therefore depicted in the map’s nomenclature. 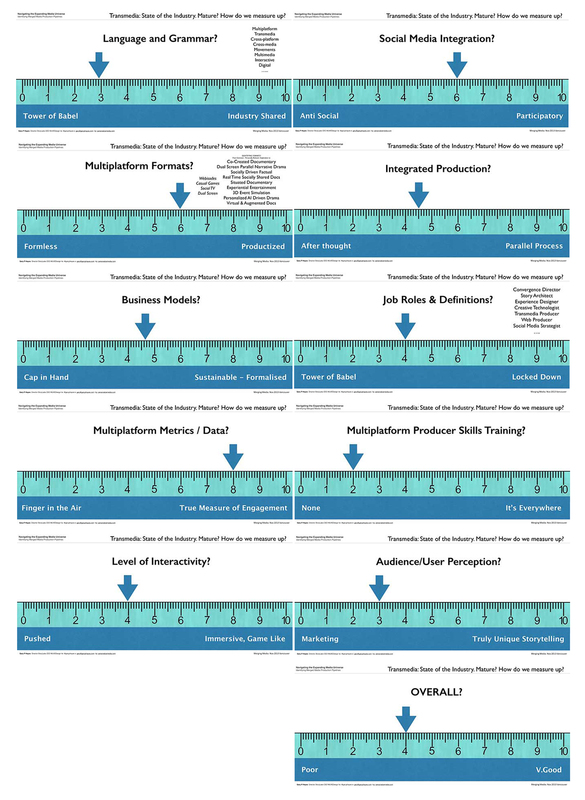 A map that carries this framework and that is updated to reflect the most current data can be an incredible creative asset and analytical tool for multiplatform storytellers to employ across various stages of the narrative-design-production-release process. The entire physical landscape is designed around the ‘uncharted transmedia story vortex,’ which we are to navigate by linking these various lands. We see several “Ships of Stories’ sailing these waters, yet the map fails to demonstrate how those sailers can steer toward an “overarching’ narrative or story structure — the fundamental binding force of multiplatform cultures and rituals. It also doesn’t recognize inland transit, which is a more common pattern in transmedia landscapes. An online gamer is more likely to traverse media and participate in a Live Action Role Play than read a novel, preferring to navigate in familiar spectrums. In 2013, Gary Hayes added a more scalar, quantitative element (see appendix) to his collective presentation (the cartographic maps, the article and the keynote), which adds to the dimensionality of the what can be considered a deep map of the state of transmedia. 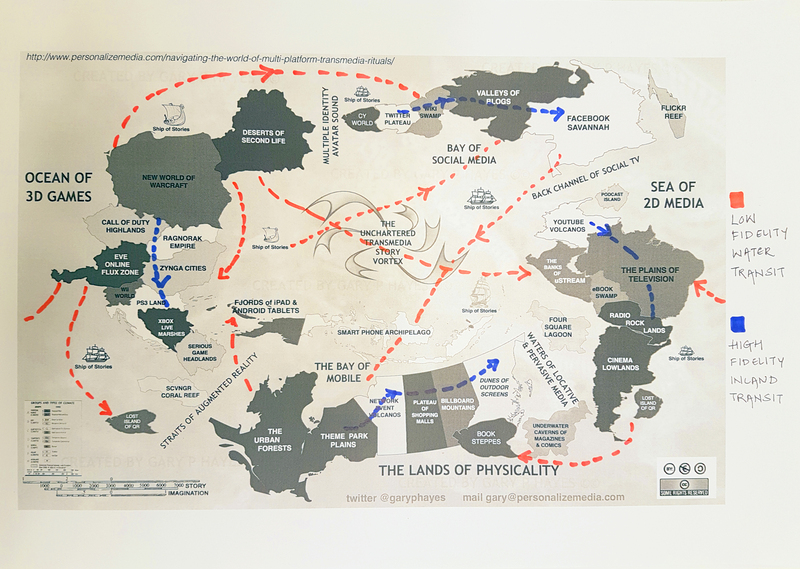 Despite its shortcomings, however, the map identifies and highlights some key issues within the transmedia storytelling practice and provides a novel way to think about its geography. 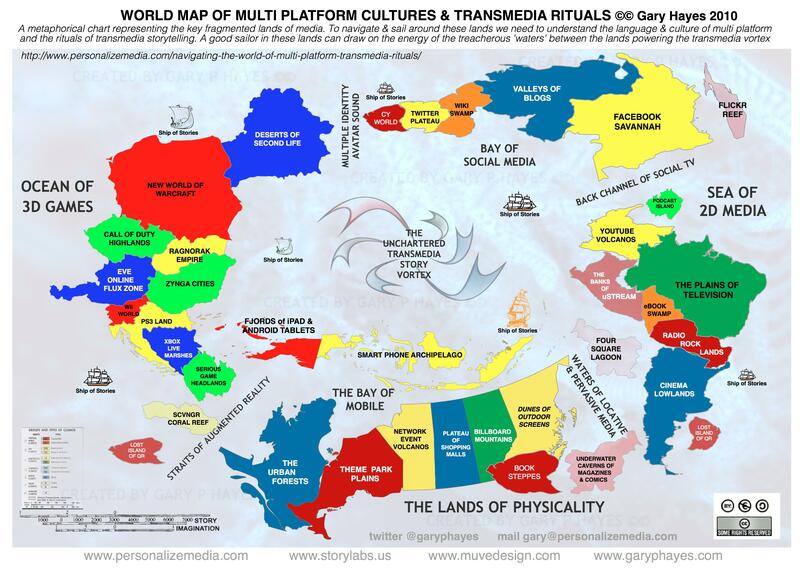 This map attempts to add a layer of clarity in transit across different media platforms. It also defines patterns of movement between platforms that share common conventions and those that are more distinct, an aspect noted in the critique. This set of maps juxtaposes a transmedia map drawn by Disney Productions in 1957 first on the 1970s map and then on the 2010 map to compare the applications of the transmedia method and its also evolution to a certain extent, giving us an idea of the arena or the territory a long-time existing narrative intellectual property occupies within the larger media geography. This map juxtaposes a form of non-linear transmedia story architecture drawn by Dr. Peter von Stackelberg, based on the popular three-act structure, with the center of ‘The Hero’s Journey’ overlaid on the transmedia story vortex and the non-linear experience converging around this point, another aspect elucidated in the critique. 1. Hayes, Gary. “Navigating an Expanding Multiplatform Transmedia Universe – Production Keynote.” PERSONALIZE MEDIA, 2013, www.personalizemedia.com/navigating-an-expanding-multiplatform-transmedia-universe-production-keynote/. 2. Stackelberg, Peter von. “Ontology: Characters (Part 4).” Transmedia Digest Narrative Design across Media, 27 Feb. 2012, transmediadigest.blogspot.com/2012/02/ontology-characters-part-4.html. 3. Boukobza, Philippe. “Visual Mapping.” A Visual Map Created by Walt Disney 53 Years Ago, www.visual-mapping.com/2010/05/visual-map-created-by-walt-disney-53.html.